I sat down next to Eli 10.3 in the dressing room and put my hand on his shoulder. "I love you, buddy," I said, "and that was incredible." "I lost the game," he said, crying. "You didn't lose the game, but it's okay to cry," I said. "I know it hurts. But a little while from now, when you feel better, I want you to celebrate what you did today, because it was special." A few of Eli's teammates had thrown their sticks as they entered the locker room, frustrated by four consecutive losses, and even more frustrated that the last game had slipped away. But it only took a few seconds for them to notice Eli in the corner, and when they did, a curious thing happened: they stopped being angry. Over the course of the next few minutes, every single kid walked over to Eli. Some put their hand on his shoulder, a few put their arm around him, and all of them were kind. "Don't feel bad," one said. "We had no chance without you. None." "That's the best I've ever seen a goalie play," said another. Each time, their kindness would make Eli cry harder for a little while. And then the moms came in, and most of them came over and hugged Eli. He's a mom favorite, and they did everything they could to make him feel better, but it just made him start crying again. It's hard, being a father, because there was nothing I wanted to do more than burst into tears. I couldn't, though. I had to be strong and positive for my son, to help him through, and whatever else I felt, I had to eat. When we had his gear packed, we slowly started our way out of the arena. Eli was just wearing his black UnderArmor and his blue sneakers, his eyes red and swollen. I was carrying his leg pads, and as we walked out into the lobby, I saw a few parents from the other team (travel team parents usually have "team jackets" that they wear, so it's easy to know who they are). Then another curious thing happened: they recognized the leg pads, and every single parent stopped me. "Is that him? The goalie?" one parent asked, pointing at my sad little boy with the red eyes. "He was unbelievable. It was amazing." Another parent said, "He should feel great about how he played. He was brilliant." A few of them patted Eli on the shoulder, and he thanked them as he tried very hard not to start crying again. There was a photography firm that took pictures during the tournament, and we had decided to buy a CD with all his pictures. It was going to take a little while, though, so we packed his gear in the car, then came back into the rink. One of his best friends was in goal for the Peewee final, and we both wanted to see him. At first, I thought this might be a bad idea, but as it turned out, it was the single best thing to do. Eli was happy for his friend Miles, who played a great game, and we wound up getting to watch the entire game, even seeing the team accept the championship trophy. Eli was much better by the end of the game. On the way home, we stopped at a restaurant, and we both went to the bathroom before we left. "I wish I could've thought of what to do," he said. "You have a tool," I said. He thought for a few seconds. "The poke check!" he said. "That's right," I said. "And I want you to understand something. I know you were nervous in the shootout, but it wasn't your nerves. Preparation brings clarity, and you'd never even worked on shootouts before. You felt nervous because you weren't prepared. We're going to look at shootouts together, and you'll understand them, and you won't be nervous next time." "I'll be ready," he said. He was quiet for a few seconds as we washed our hands. "Hey, what did you feel?" I asked. "A lot of things," he said. "But mostly, when the shootout started, I felt nervous." "There are people who reach the precipice of something great," I said, "and when they look over the edge, they see what's in front of them and they get scared. But that's not you. I've never, ever seen a kid handle pressure the way you do. It was just lack of preparation, and when you're prepared, you'll step to the edge, see what's in front of you, and embrace it." "You really were ridiculous today," I said. "Seriously--35 saves?" He gave a little laugh. "I needed 36," he said. Almost as soon as Gloria started the car for the drive home, he fell asleep. He slept for almost 2 hours, exhausted, and we were just about to reach Waco when he woke up. I knew immediately that he felt much better, and that the Enthusiasm Engine was already recharging. 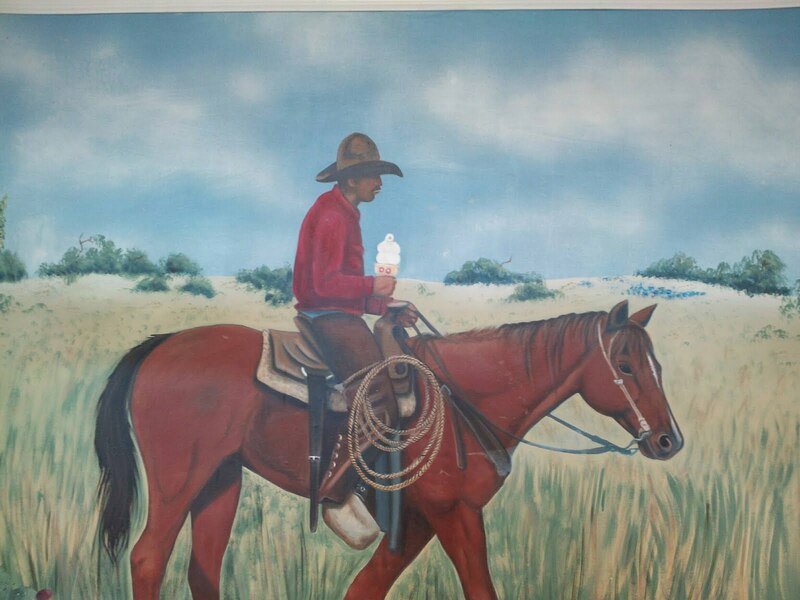 We stopped at a Dairy Queen, and we saw what must be one of the greatest murals in history. "Do you see that?" I asked Eli. "Oh my god," he said, laughing. "That's awesome." "What makes this totally classic," I said, "is that the cowboy has an ice cream mustache. That is so outstanding." "Even better," Gloria said, "it's not a cowboy. It's a vaquero." "You're right," I said. "That is awesome in every way." We laughed about the vaquero with the ice cream mustache, and in the booth next to us, three cute little girls who were identical triplets sat with their father, eating the same ice cream cones as the vaquero riding trail above them. Eli smiled at the girls, then looked at me. "Ready, Dad?" he asked. "Let's go home," I said. We were still on the road when the sun started to go down. The sky was all clear, and the colors were beautiful, blue bending into orange into yellow. It was one of the biggest, loveliest sunsets I've ever seen, and we watched it together as the road unspooled and we headed home.